CoolEssay.net Review with Discounts, Prices and Testimonials. Is the Place Actually Cool?! 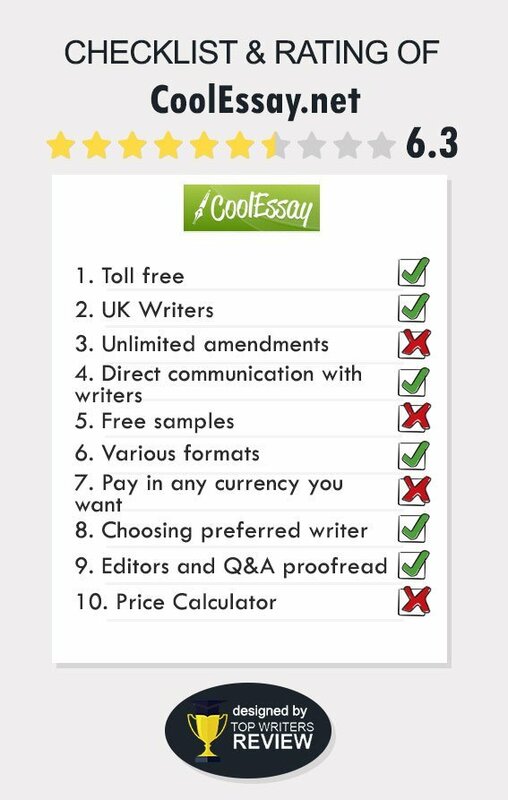 This report is a summary of our investigation and evaluation of Cool Essay, an online writing service that has been active in the industry for 6 years. Our report is based upon the same criteria and factors that we use for reviews of all online writing services – the information provided on the website itself, communication with the customer support department, Cool Essay testimonials, customer comments found elsewhere on the Internet, and our personal experience of ordering an upper university level research paper from the company. What follows is a summary of our CoolEssay review. Primary services are academic, and they include service to students at all academic levels from high school forward. Products include typical coursework assignments that any student might receive – essays, papers, reviews, case studies, projects and presentations, lab reports, and graduate level theses and dissertations. The company also offer admissions essays, editing, proofreading, and re-writing. In the area of business writing, it appears that the only offering is a business report. A customer support department operates 24 hours a day, and when we tested this statement, we found it to be true. Representatives are available via phone and live chat. The site states that all writers possess either a Master’s or a Ph.D. Because no sample writings are available on the site itself, it is difficult to determine quality of writers, other than by testimonials and CoolEssay customer reviews published on other places on the web. The other factor in determining quality was the result of our order of a research paper. The company states that all of it writers are native English-speaking scholars. We wonder why they did not use one of these writers to prepare their website content. There are numerous grammatical and word usage errors, something that does not promote confidence and trust. Customer feedback found elsewhere was mixed. High school students seem to be generally pleased. As academic level rises, however, there are more complaints, particularly in the area of composition. The research paper we received conformed to all of our instructions and was delivered on time. However, we, too, have concerns for the quality of writing of the piece. Incorrect word usage and agreement issues were found. CoolEssay BBB membership was not found; however, there were no complaints filed either, and indication that the company does operate legitimately. We can therefore say that CoolEssay is not a scam. CoolEssay.net prices are average for the industry as a whole. They range from $10.00/page for a high school essay with a 14-day deadline to $49.00/page for graduate level writing with tighter deadlines. Our paper, an 8-page, 4 resource research paper at the university level, was $151.20. In terms of making payment, the company does provide for secure payment processing. Customers may use major credit cards; however, they are all run through either PayPal or G2S, both of which are fully secure. By using these two payment processors, the company never has any financial information of a customer, so there is no threat of a breach. At first glance, CoolEssay discounts do not exist. They are not published anywhere on the site nor is there any type of welcoming discount with a Cool Essay promo code. However, on the order form there is a place for coupon codes to be inserted. We contacted customer support to inquire about this. It appears that customers will be given a small discount with CoolEssay.net coupon codes provided by that department. This is not publicized on the site except during a short video that explains the production process to customers. They are told to contact customer support if they need a discount. This area is a bit confusing. There are certain things that are offered for free – revisions and title and bibliography pages. It is also stated that plagiarism reports are provided for free; however, there is a $14 charge for one that can be added during the ordering process, if a customer selects that option. Customers may also upgrade their writers – there are three levels. Moving up to the 2nd or 3rd level comes with an additional fee. CoolEssay.net is obviously a legitimate online writing service. As we look at CoolEssay.net pros & cons, however, we do have some concerns. Writing samples are not available except for a fee; products do contain grammatical and usage errors; and there is contradictory information provided on the site, such as the number of writers and access to plagiarism reports. Overall, we have provided a Cool Essay rating of “Fair,” due to these issues. They don't write from scratch but rewrite someone's works! Truth be told, they do state it on their website but I hadn't noticed. And I find it somewhat weird that after me stressing that I need a research on an unpopular topic they said nothing but "sure". As a result, my paper word for word repeats the ideas expressed by a famous professor, the only work that's available online. Amazing company! I was worried there might be some leaks of my info within the professor and my uni, but nothing like that happened. Truly happy I picked them among all the others. I`m proud of my research paper. Impressive reports were made for my papers. I wish the papers were as perfectly nailed up as the reports themselves. To be more specific, I wish they were completing homeworks as easily and professionally, esp. when it comes to counting and university academic level students.